Music has always been a big part of ABCmouse Early Learning Academy, which offers more than 175 songs that help bring learning to life for children. 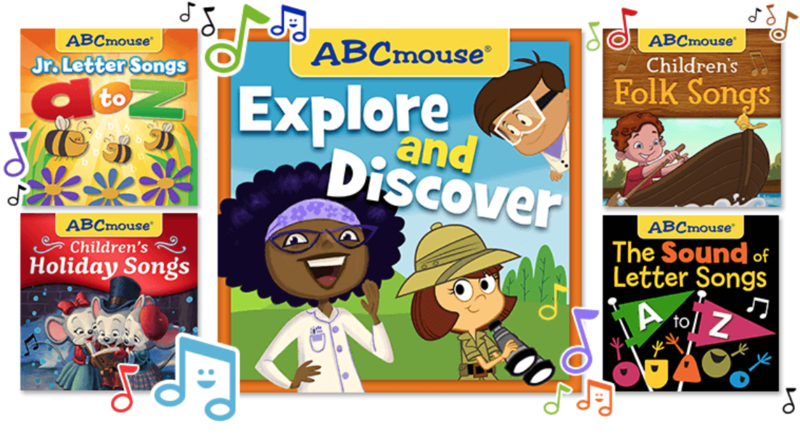 That’s why I’m thrilled to announce here that our complete collection of ABCmouse music is available on major music platforms worldwide, including Spotify, Apple Music, Amazon Music, Pandora, and Google Play. With a listener base of more than 300 million people in more than 100 countries, these platforms expand the reach of ABCmouse to many more families around the world. The ABCmouse music collection features dozens of original compositions (we’ve always had great musicians and songwriters in the company! ), including a song for each letter of the alphabet, songs that teach about numbers, shapes, colors, geography, and much more. The collection also includes many new arrangements of classic children’s songs. We produce and record all our songs in our on-site recording studios in our headquarters in Los Angeles. Families who want another (joyful) way to learn, can find our music under ABCmouse on Spotify, Apple Music, Amazon Music, Tidal, Google Play, Pandora, and several other music platforms. Enjoy! My company, Age of Learning, recently launched a new and improved Early Learning Academy app for Android devices. The updated app now supports the very latest version of Android, KitKat, and offers significant performance improvements for our mobile users on most Android devices. We’re happy to report that the Android app already has more than 1,500 ratings from the Google Play store, with almost 1,000 of them 5-star ratings. The app is free, but you will need an ABCmouse.com membership to access the content. If you are already a member of ABCmouse.com, you can simply log in through the app to access your account. ABCmouse.com members enjoy full access to our online preschool, pre-k, and kindergarten curriculum on their Android device. With more than 5,000 engaging and interactive learning activities covering reading, math, beginning science and social studies, art, music, and much more, this program offers a one-stop location for the educational needs of children ages 2-6. Age of Learning also offers an Early Learning Academy app on iTunes. The latest free app for iPhone and iPad users (and ABCmouse.com members) is currently getting a 4.5-star rating. After you download one of the apps, leave us your (and your child’s) rating, too. Here’s to better early learning–on the go!